No research on Border Terriers can be complete without reviewing the Border Terrier Club of America's website, including the Frequently Asked Question page and the Border Terrier In Brief. While Border Terriers are a friendly breed, they do need to be properly socialized as puppies and should attend puppy kindergarten and basic obedience classes. Socialization should continue periodically as they age. 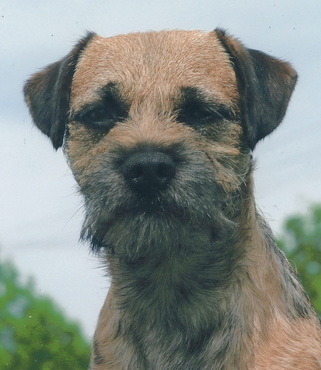 Even though popular 'what's my breed' books and websites say that Border Terriers do not shed, that is a myth. Hand stripping (or using a stripping "knife") on a regular basis will help to lessen the dust bunnies. Using a clipper softens the wiry all-weather coat that Borders are known for and gives them a gray appearance. And, no, Border Terriers are NOT reliable off lead. When outside, they should either be on lead or safe within a fenced yard with no gaps at the edges or under the fence panels. A lot of health issues can be directly related to the quality of food that a dog eats which is why it is important to research the type of food that you feed - know the ingredients and where they come from and understand why they are or are not important components of a well rounded canine diet. Many dog foods and brands have been involved in recalls for one reason or another, some voluntarily because a problem has been identified and they are being proactive and others because a large number of dogs became sick or worse. There are several websites that provide good information and review the various brands and varieties of dog food being produced. The following two websites are good resources for unbiased information. Because Border Terriers DO shed, that also means that they are NOT considered a hypoallergenic dog. Most dog allergies are caused by dander (which is attached to dog hair being shed) and/or saliva. If you have a dog allergy, then most likely you will be affected adversely when in contact with a Border Terrier. So, depending on the severity of your allergy, you can either choose to live with your body's reaction when in proximity to the allergen or you can look for a non-shedding dog that would/could lessen your reaction to dander.